Greater emphasis on practitioner oriented content. Publishing in both print and online the Encyclopedia will be an invaluable aid to researchers, lecturers, students, consultants and policymakers engaged in ecological statistics, climate change, geostatistics, natural resources, risk assessment, environmental health, physical processes, chemometrics, stochastic modelling, forestry, acid rain, and pollution. 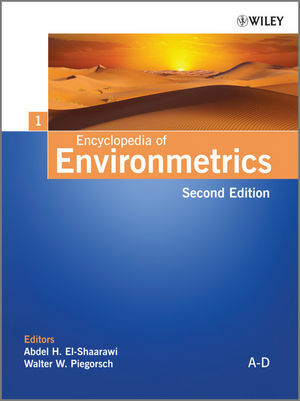 Abdel El-Shaarawi, National Water Research Institute, Ontario, Canada and McMaster University, Ontario, Canada and The American University in Cairo, New Cairo, Egypt is the founding editor of the journal Environmetrics and founding President of The International Environmetrics Society. El-Shaarawi is also an elected member of the International Statistical Institute and a Fellow of the Royal Statistical Society (United Kingdom), the American Statistical Association (ASA) and the Modelling and Simulation Society of Australia and New Zealand. Walter W. Piegorsch, BIO5 Institute, University of Arizona, Tucson, AZ, USA is the current Editor-in-Chief of the journal Environmetrics and a previous Chairman of the American Statistical Association Section on Statistics and the Environment. Piegorsch is also an elected member of the International Statistical Institute and a Fellow of the American Statistical Association (ASA). He previously served as Joint-Editor of the Journal of the American Statistical Association (Theory & Methods Section) and on the Board of Scientific Counselors for the U.S. National Toxicology Program.